You have your dream home, ready to make your mark with a whole host of ideas, set to transform your house into something that wouldn’t look out of place on the glossy pages of a high-end interior design mag. Only, where do you start? Sure, picking your furniture and even your cutesy accent pieces is relatively easy, but what on earth do you do with the floor? This may sound obvious, but if everybody considered their flooring, carpets in bathrooms would never have existed. It’s important to consider the room and what it’s going to be used for. In a kitchen, you’ll need to think about the possibilities – what could go wrong, that is. Sorry to be a pessimist, but expect your kitchen to undergo a number of spills, splashes and smashes. It’ll need to be hardy enough to survive dirty paws, dirty feet and a high traffic volume too. Again, you’d think this one is quite obvious, for example, if you’ve got pets and kids, you may need to rethink the sophisticated, snowy floor you had in mind. It might look swanky – but it won’t stay that colour for long, and, soon enough your elegant white room will look a little more like fifty shades of ghastly grey. If your kitchen is next to the back door and you’ve got a dog/cat/horse or an extremely keen mini football player – it’s probably wise to reconsider the white tiles. Otherwise you’ll spend half your life, stuck in the kitchen, mopping up. Even Cinderella managed to escape all that! Similarly, for entrances and hallways when shoes are still on – beige or natural coloured carpets will look grubby and grimy pretty quickly. Not got kids or animals? Unless you’re a mucky pup, you can more or less go for any floor but think to the future. Is this a lifetime-home? Or are you planning on selling? Once you’ve deliberated on these options… it’s plain sailing. 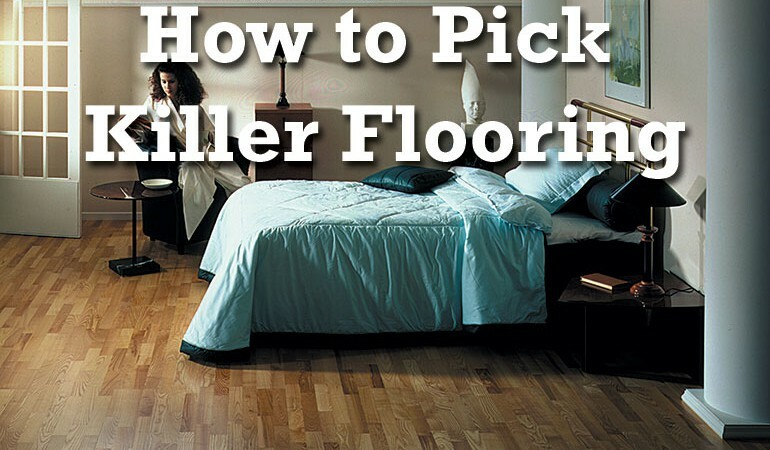 All you need to do now is pick a killer floor to match your room. 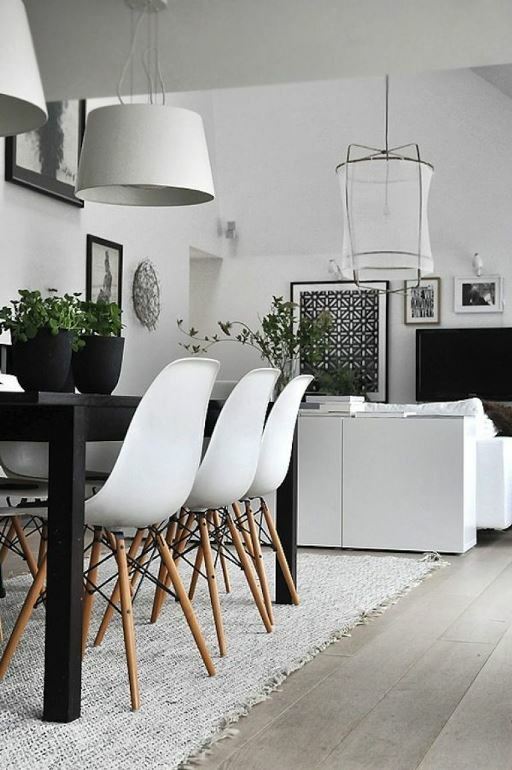 Categorised by varying shades of greys, cool whites and soft, fluffy furnishings, Scandinavian décor is definitely one of the hottest looks right now. Though modish, this interior can feel quite cold because of the harsh monochrome colour scheme so add warmth through your flooring. Scandinavian kitchens are typically black and white with chrome and highly contemporary finishes such as spotlights, industrial-style lamps… and the odd antler ornament thrown in. Create a contrast by choosing a wood or laminate floor in either black oak or white oak shades. For a softer look, choose something closer to a maple colouring. Vinyl planks are gaining popularity for their economical and durable nature. They come in a range of colours and most can be installed directly over floors, meaning they are easier to install and maintain. Laminate is cheaper whilst still delivering the look of real wood. There are many different styles and colours available and laminate can be made to look like wood, stone or even ceramic. If funding is tight, then this is a perfect option! Whilst not recommended for bathrooms or damp areas laminate is highly durable – resisting stains, dents and it’s easy to install yourself. It can even be laid on top of existing floor eliminating the need for expensive installations by professionals. 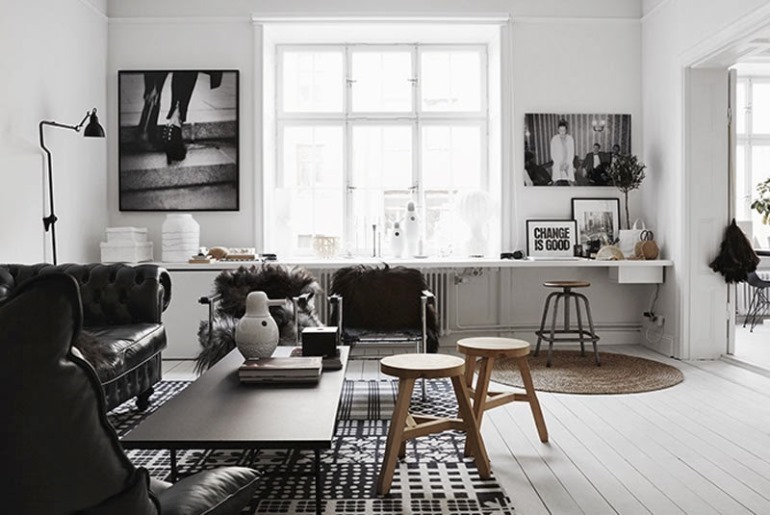 For Scandinavian living areas – don’t forget to add a (faux) sheepskin rug and/or a grey knitted floor cushion to a cool floor to inject a little homeliness! Simplicity is key in this type of décor. In bathrooms, tiles are king. Choose a patterned tile to create your own funky flooring or stick with monochromatic subway tiles to give your bathroom an edge. Dark flooring can also be used in modern minimalist styles, Hollywood or Gothic glamour gaffs and hi-tech homes whereas white flooring creates the ultimate finishing touch to a shabby chic, nautical lodging or industrial interior. Country cottage and vintage looks have long been firm favourites in the design files. 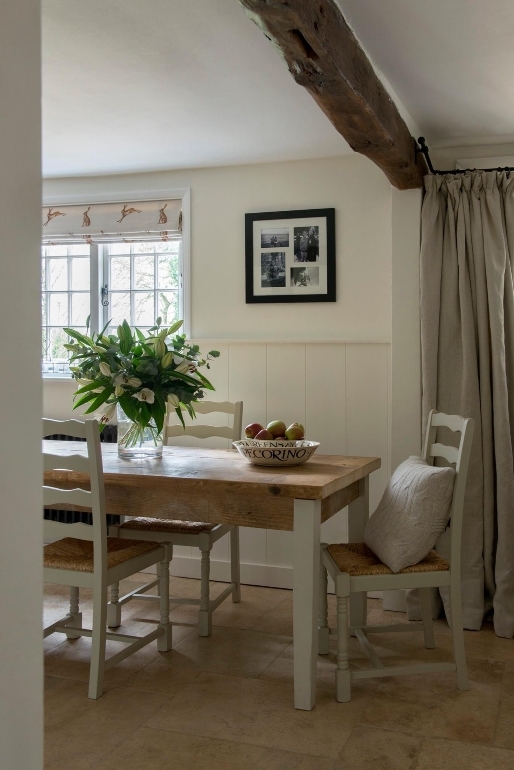 Think original, oak beams, exposed wood, farm houses and riding your bike to pick up the morning milk! This style relishes in reclaimed wood and cosy corners – with a huge fireplace to boot. Quintessentially British; country kitchens make the most of original features so recreate the vintage vibe by using wood or stone floors. The variety of stone is huge and the authentic beauty is second to none. Stone is one of the most expensive materials around though so you could end up spending a big buck! 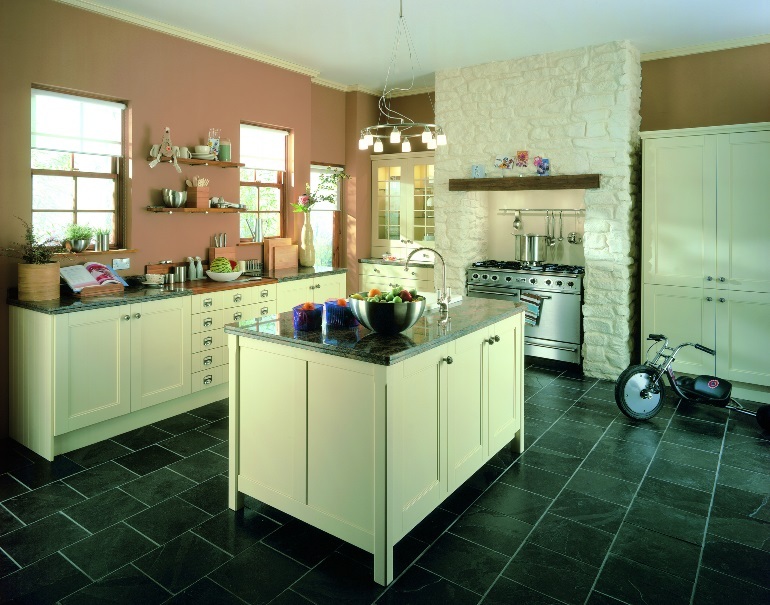 Slate, limestone and flagstone are also great options for a country kitchen. Natural stone tiles are highly unique and distinctive. With countless different cuts and styles you can be assured that your floor will be unlike anyone else’s. Stone floors are easily washed, cleaned and vacuumed unlike carpet meaning it’s a hygienic choice. For an extra injection of luxury – install some underfloor heating as stone tiles can get very cold during winter months. Either that, or make sure you’ve got a hefty stash of slippers! To create the ultimate country home cosy lounge, reclaimed wood floors in shades such as aged walnut or warm oak will be perfect. For the modern-day eco-warriors amongst us, it may be worth buying laminate instead of wood as to avoid buying rare wood materials. Avoid wood in your country bathroom; instead choose a tiled floor or cool cork flooring which is eco-friendly and naturally mould resistant. 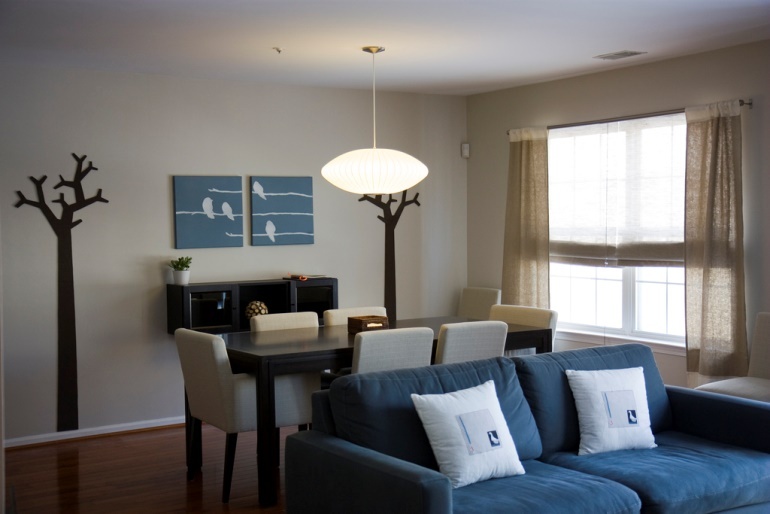 Modern homes are categorised by their fuss-free, uncluttered, functional designs. Modern homes make the most of clean, geometric lines and avoid excessive accessories. Art, rather than knick-knacks, is most at home in a modern home and the ‘less-is-more’ ideology definitely rings true in this interior style. Perfect for apartments and a firm favourite with young, busy professionals; modern design gives the illusion of space and light. Blacks, whites, neutrals and primary colours are ideal for the modern space and bold contrasts are an ideal backdrop against some darker colours. Peaceful, quiet and harmonious bedrooms work well with modern and contemporary styles. A range of colours can be used here but ensure the effect is calming rather than passionate. Carpets and rugs are ideal for relaxing and letting loose in a modern bedroom. Strong natural fibres are cool and practical and will make anyone feel warm and cocooned. A perfect escape from the hustle and bustle of everyday life! Rugs and carpets are warmer underfoot than wooden or stone floors and will make a huge design statement. 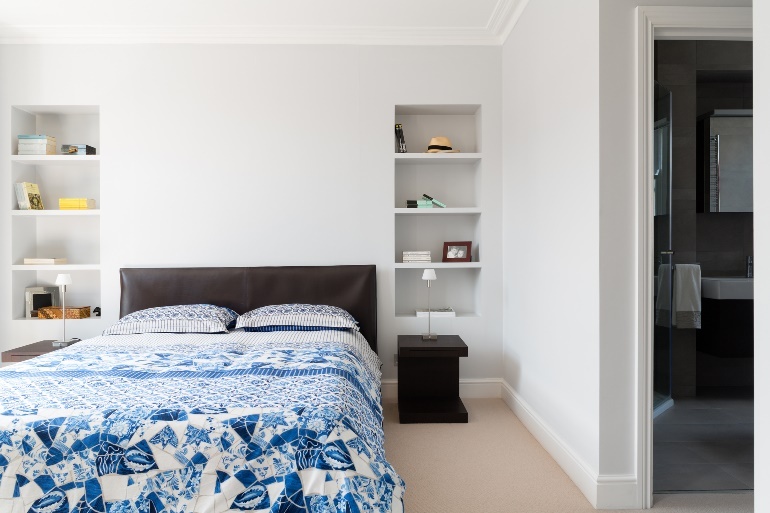 A large rug in the centre or under the bed can create a focal point to the room. Horizontal striped carpets will make a room feel wider whilst vertical stripes can make it seem longer. What about a rubber? No, not an eraser! A rubber floor. Rubber floors are highly contemporary and would be picture-perfect in a child’s bedroom or playroom. Kitchen and dining areas are also great spaces to incorporate a rubber floor. It is extremely durable, non-slip and provides a fantastic cushioning to minimise any impacts – from kids knees or otherwise! Maximise the use of carpets and rugs in other home styles such as French-styled interiors, contemporary crash pads or vintage dwellings. Rubber floors look best when used in exotic styles such as Arabian and Moroccan habitats, industrial interiors, retro residences or eco-friendly family homes. Now it’s over to you! How did you pick your floor? Got any tips when it comes to picking a killer floor to match your décor? We want to hear from you so drop us a comment, Tweet us or find us on Facebook!